A fishing rod is a tool used for fishing. Alternatively it is used as an intermediate step for crafting the carrot on a stick. There is a chance of catching a fishing rod while fishing. It is part of the treasure category. The fishing rod can be crafted using three sticks and two pieces of string. The fishing rod is used in the recipe for the carrot on a stick. 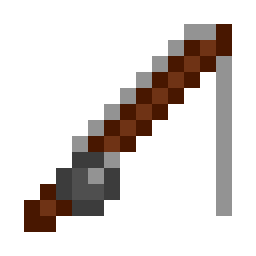 The fishing rod can be cast at mobs, and if the player shift clicks again, it will fling the mob in the opposite direction which the cursor is in. The fishing rod itself does not cause damage to the mob. The fishing rod can be enchanted directly through the enchantment table. It can be enchanted with the unbreaking, luck of the sea, and lure enchantments. Unbreaking makes it less likely to take durability damage when used, luck of the sea increases the chance of getting "treasure" when fishing, and lure decreases the time taken for something to be caught. This page was last edited on 24 December 2018, at 09:06.